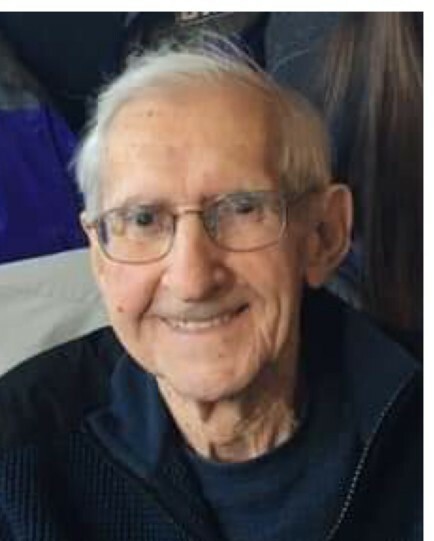 On Saturday, January 19th, 2019, Raymond L. Fritz, 92 years old, peacefully passed to join his wife of 65 years, Norma Z. Fritz. Raymond was born in Detroit, Michigan, on September 15, 1926. His parents were Herman and Martha Fritz of Dearborn, Michigan. Raymond’s parents were both deaf, and he was taught American Sign Language (ASL) at an early age. Raymond loved sports as a child and would work at the baseball stadium to see teams from all over the country. He shared many stories about meeting famous baseball players and collecting their signatures after the stadium closed for the evening. Raymond took pride in the fact that he held the most varsity letters at his high school; however, this was because he served as the water boy for nearly every team (he admits he was no good at sports). He worked at Ford Motor Company with his father until he was drafted to serve in World War II in January of 1945. He served in the US Army and was stationed in the Philippines until August 1946. When Raymond returned home from the war, he began college at Michigan State. During this time, he met his beautiful wife and they were married in September 1950. Raymond graduated Michigan State in 1953 with a bachelors of science in Zoology and a minor in Entomology. He studied freshwater fish until he was offered the position as a biologist with the Bureau of Commercial Fisheries in Woods Hole, MA. Raymond transitioned to salt water marine biology, and he became the Chief Scientist on both the Albatross III and Albatross IV. While working at Woods Hole, he helped to develop new technology for surveying fish. He is said to be one of the “founding fathers” at Woods Hole for developing and implementing these techniques. After working in Cape Cod for about ten years, he was offered the position as Chief of Law Enforcement for the National Marine Fisheries Service in Washington DC. Raymond continued his work for the government and transferred to the National Fish and Wildlife Service; he served as the Outer Continental Coordinator for Oil and Gas Development. Raymond retired after working for 38 years for the US government, and he moved from Falls Church, VA, to Deale, MD, in 1987. Raymond loved to travel, whether it was for work or pleasure. Some of his favorite trips included going to Japan, Alaska, Europe, Las Vegas, Jamaica, and Disney World for his 50th wedding anniversary with his entire family. He and his wife shared many hobbies as well; the two held season tickets for the Washington Capitals and Baltimore Orioles, were members of the Kennedy Center and loved the arts, delivered for Meals on Wheels for over 25 years, attended the Philadelphia Flower Show, were avid gardeners, and with Norma serving as First Mate, enjoyed fishing on their boat. Raymond loved to host guests at their house on the bay and show the backyard view. He was able to make friends with people wherever he went, and his infectious smile truly lit up the room. Most of all, Raymond loved his family. He lived to teach his grandchildren new trades, whether they were how to set a crab trap or how to make key lime pie. However, his most treasured time was spent in his backyard, on lawn chairs overlooking the Chesapeake Bay with his entire family by his and Norma’s sides. Raymond is survived by his son, Gerald Fritz and wife Karen of McLean, Virginia, daughter, Donna Bruch of Vienna, Virginia, five grandchildren, and one great-granddaughter: Rachel (Larry) Michael, Hilary (Gabe) Thran, Leah (Tom) Jewett, Lindsey (Tim) Nelson, Tyler Fritz, and Nalani Michael. Raymond was predeceased by son Lawrence David in 1969, and brother Marvin Alvin Fritz in 2003.